On the Groups tab, click Create new group. 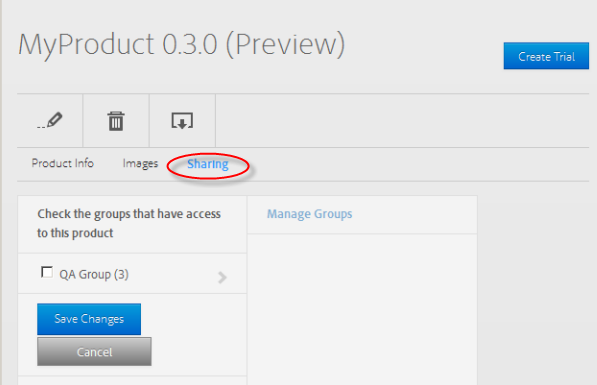 The new group is now listed; if you have more than one group, select the group name in order to add members to it. Click Add new members to begin adding members to the selected group. Add a group member by entering a valid email address. You can add multiple members by providing several addresses separated with commas, or you can click Add new members again to add more members. 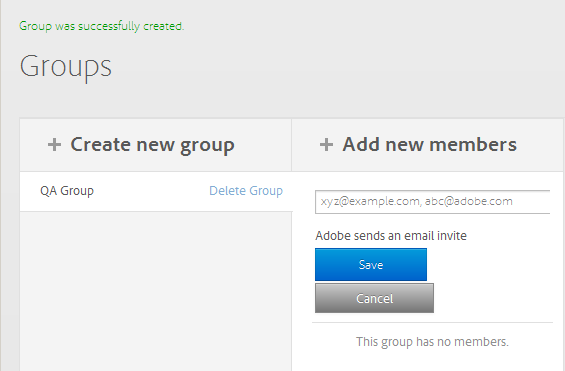 Adobe Exchange automatically sends an invitation to each email address that you specified. Recipients click the Accept Invitation link in the email to accept the invitation to the group. They are redirected to a login page where they can enter their Adobe ID and log in OR create a new Adobe ID. The Adobe ID they use to accept the link will be tied to the group in Adobe Exchange. You can share your unpublished product with other members of your development team OR share your published products with your customers and other members. Navigate to the My Products section of the site to see the list of Published or Unpublished products. Select the product you want to share, and click it to show the Product Info page. 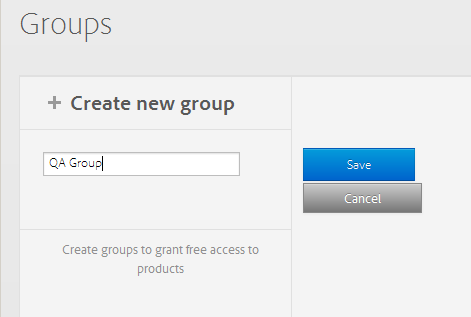 Use the check boxes to select the groups that you want to share this product with and click Save Changes. 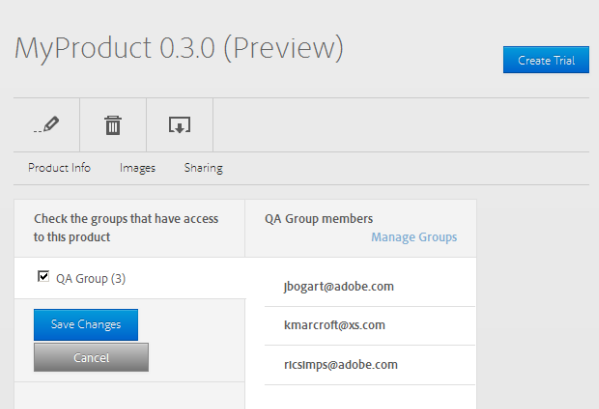 This automatically grants members of a selected group free access to your product. You can click the arrow by a group name to see the members of that group. 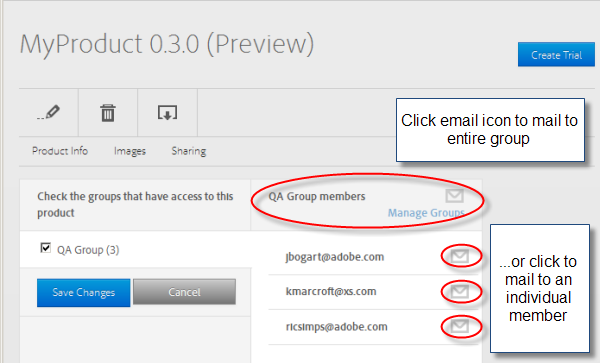 After you save changes, the groups and group members with access are shown with an email icon next to each email address. You can choose to email individual members of the group, or the entire group. When you click one of the email icons, your default mail client opens a pre-populated message that includes a link to a page where they can get the basics on how to access the product. If you want, you can customize the message in your email editor before you send it. 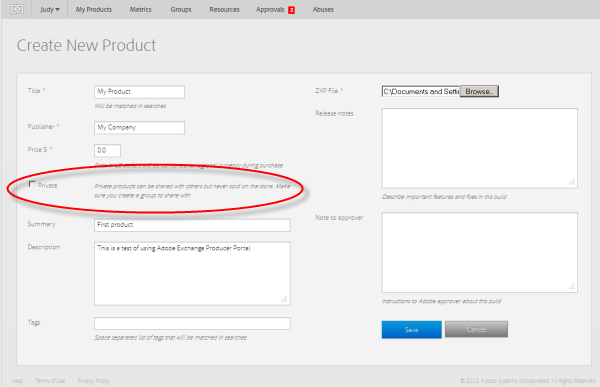 When creating a free product, you can mark it as “private”. Paid products cannot be private. When a product is marked as private, it does not appear in the general All/Paid/Free tabs on the Adobe Add-ons web site. It appears only on the My Add-ons page for the members of the group with whom you have shared it. You mark a product as private when you first create and upload it. It will only be available to you the producer and users and groups you have share it with. It will not appear on the public website, only in the My_Addons section. If you ever want to release the product publicly, you can still share it with a group of testers before submitting it to be approved for publication. Upon submission it will go through the usual vetting review procedure before being released publicly. Private products are released immediately without vetting from Adobe.